October 2014 – Theologians, Inc.
– It may be helpful to distinguish the UoC from the binding problem, however, in the following way: the UoC is a metaphysical ‘problem’, while the binding problem is a psychological/biological ‘problem’. – Breakdowns within various perceptual modalites does not = breakdown in consciousness. 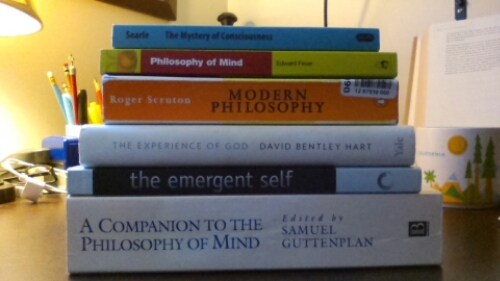 Hopefully I can do a bit of writing on philosophy of mind later on. To understand Moltmann we must understand Classic Marxism as interpreted by Marxist/atheist Ernst Bloch (esp. his masterwork ‘Das Prinzip Hoffnung’ (The Principle of Hope, 1959) and more general conversations between secular Marxists/socialists and Christian intellectuals of the time regarding which Moltmann’s The Theology of Hope (1969) is a mere footnote that became very popular in the context of the Ecumenical Movement. Central to dialogue was the category of hope as a major issue of common concern, rethinking this issue in a manner facilitating achievement of common goals was a common task. “The past is prologue” of Classical Marxism found development and expression in Marxist/atheist Ernst Bloch’s masterful analysis of hope which fed directly into to Moltmann’s. Bloch recovered the root metaphors of apocalyptic literature as a manner of portraying the nature of man and political reality e.g. oppression. Key to Bloch’s use of hope is the conviction that our being in the world necessarily involves the not-yet – a form of “transcendence” even apart from considerations of otherworldly eternity (compare Moltmann’s theological elimination of this latter category correlates to his understanding of not just God and the Word of God, but the Trinity -vertically, i.e. a world-historical understanding of transcendence and Trinitarian theology). Whereas for St. Basil, “No one has ever seen the essence of God, but we believe in the essence because we experience the energy”, leftward leaning Christian intellectuals within the Ecumenical movement regarded this as if not a point of contact, at least an agreement relative to common praxis. Moltmann regarded God’s ousia as self-defined in the historical process (psychology of God an even more fruitless enterprise than psychology of the living or psychology of the dead IMO). So (1) the essence of God is knowable; (2) it is known not only in the historical process, but only in the historical process. Bloch would surely not have objected. Moltmann’s vertical perspective of things divine included a denial of the epiphanic. On this view there can be no union or theosis in the classical sense of the earliest apostolic fathers. Moltmann was wrong to view classical Trinitarian and Christological thought as abstractions; they were over safeguarding the Church’s experience of salvation as union (as described in Lossky, The Mystical Theology of the Eastern Church, ch 1). As church historian J. N. D. Kelly has noted there was no other view of salvation among the apostolic fathers besides this. Politics aside or not aside, to find an entirely divergent epistemology, soteriology, ontology, ecclesiology, and so on than the apostolic fathers which explicitly contradicts the heart of their faith and casts Christianity in an entirely alien key is to my mind no less dubious than something like the Scofield Reference Bible; I do not say that simply because I’m Eastern Orthodox. That is not to say everything in Moltmann is disagreeable, but his understanding of God, Trinity, Christ, the Church are clever innovations incommensurable with classic Christianity as understood by the Eastern Church.